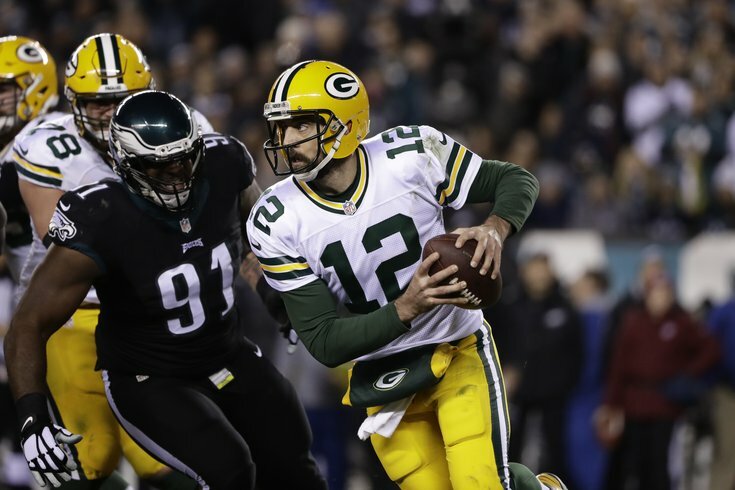 Packers QB Aaron Rodgers escapes Eagles defensive tackle Fletcher Cox. Fletcher Cox is the guy getting the most attention as the Eagles defensive line has gone from one of the most productive in the NFL to, well, one of the least productive. But his struggles are emblematic of a larger problem that's now spread across the entire defensive front – they simply aren't getting pressure on opposing quarterbacks and, as a result, are struggling to create turnovers. At one point not too long ago, they were among the league leaders in both categories. Now, they're in the middle of the pack, ranking 16th in sacks and 10th in takeaways (although they're nearly as close to the league's worst team, Jacksonville, as they are to the league leader, Kansas City). That's not all Cox's fault. "Honestly, I'm not really worried about any one player's production," defensive coordinator Jim Schwartz said Thursday. "We're worried about the production of our defense. We haven't had sacks the last couple weeks. We need sacks to be able to help our team. That puts them in third down-and-longs; it gets off the field on third-and-long; it forces turnovers. We haven't forced turnovers the last couple weeks. "I think that the best way to help an individual player is the other players around them do [their] job and he does his job the best he can. You can't get frustrated and you can't press to try to make a play because that's when you start bleeding in other places. I think Fletch understands that it's the performance of our defense. He's not a selfish player." Cox has 19 tackles and four sacks in 11 games this season, both of which are tied for second on the team among defensive linemen. However, he hasn't recorded a sack since Week 5, and right around the time the defense as a whole suddenly forget how to get to quarterbacks not named Sam Bradford. When you plot it on a chart, you really start to see the drop-off. It's been most of the same guys out there every week for the defense, so what's changed (aside from the opponent) that's prevented the Eagles from getting to opposing quarterbacks? "I don't think there's anything changed. I think sometimes it's the opponent. Sometimes the ball comes out quick and you have to do a good job in coverage. If they want to try to get it out quick, you have to get off the field on third down. I mean, there's a lot of ways to avoid sacks and I'm sure offensive coordinators go in and say, ‘Hey, this team can generate pressure, this team has made big plays sacking the quarterback and forcing turnovers and things like that.’ So that’s going to be their objective -- to stay away. "I think a lot of it, also, can deal with the score of games. In a lot of those early games, we had nice leads. You know, it's easy to rush the passer when you have a good lead. We haven't had as many leads, and I think Atlanta probably is the outlier in there. Regardless of how you get it done, we've got to keep the points off the board. "Our goal isn't to get sacks, even though sacks help us accomplish that; our goal isn't to stop rushing yards or stop passing yards. Our job is to keep points off the board and particularly in these last couple weeks, I don't think we've done a good enough job of that. We've got to take advantage of the opportunities we have. If you're not making those big plays and you're not making those game-changing plays, then you've got to find a way to make the -- I don't know what you call them -- the nondescript plays. Make them efficient and just out-efficient the offense. When it comes to the scoring aspect of things, Schwartz echoed something he said earlier in the season -- he doesn't care how many points the opposing team puts up, so long as it's fewer than the Eagles. And even though the recent QBs they've faced may have come in with a gameplan specifically designed to beat the Eagles pass rush (i.e. getting rid of the ball quickly), there are still things his unit can do combat that. "But coverage goes hand in hand with rush. If we can get those guys covered well enough that they can make the quarterback hold the ball a little bit longer, I think the other part that goes into it is third down. If you can put them in third down-and-long situations, they can't throw quick. So, I think all of those things go hand in hand – combination, rush and coverage. It's starting to become a chicken-and-egg type scenario. Does good pass coverage lead to more pressure up front? Or is it the pressure up front that makes the coverage look better? The one thing we know for sure is that neither area is operating at maximum efficiency. That being said, the Eagles haven't given up more than 29 points in a game this season. Still there's reason for concern now that the defense has gone back-to-back weeks without forcing a turnover after getting at least one takeaway in each of its first nine games this season. 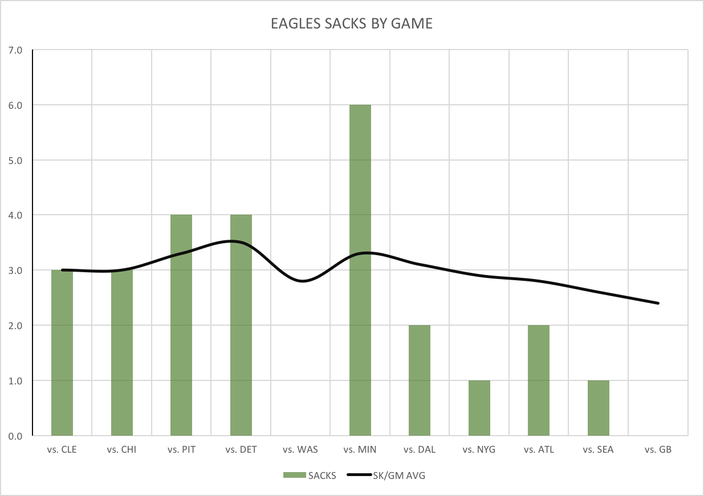 In their Week 7 win over the Vikings, the Eagles recorded six sacks and four turnovers. In their five games since, they've combined for, you guessed it, six sacks and four turnovers. "I think the big thing that's been missing last couple weeks have been the takeaways and the ability to create lost yardage plays to put teams behind the chains, put teams in those third and extra longs, second and extra longs and when we do, particularly this last game, we couldn't get them off track but when we do that, things work good for us. When we don't, we haven't held them to enough -- or we haven't limited their scoring enough." They'll get another chance to get back on track on Sunday when they visit Andy Dalton and the Bengals (3-7-1), who will be without leading receiver A.J. Green and running back Giovani Bernard, two players who accounted for the vast majority of their offense. They've now lost three straight, and have turned the ball over five times and averaged just 15.33 points per game in those games. Oh, and they've allowed the fourth most sacks by any team this season (32), and give up nearly three per game. Maybe this is the week the defensive line gets back on track.